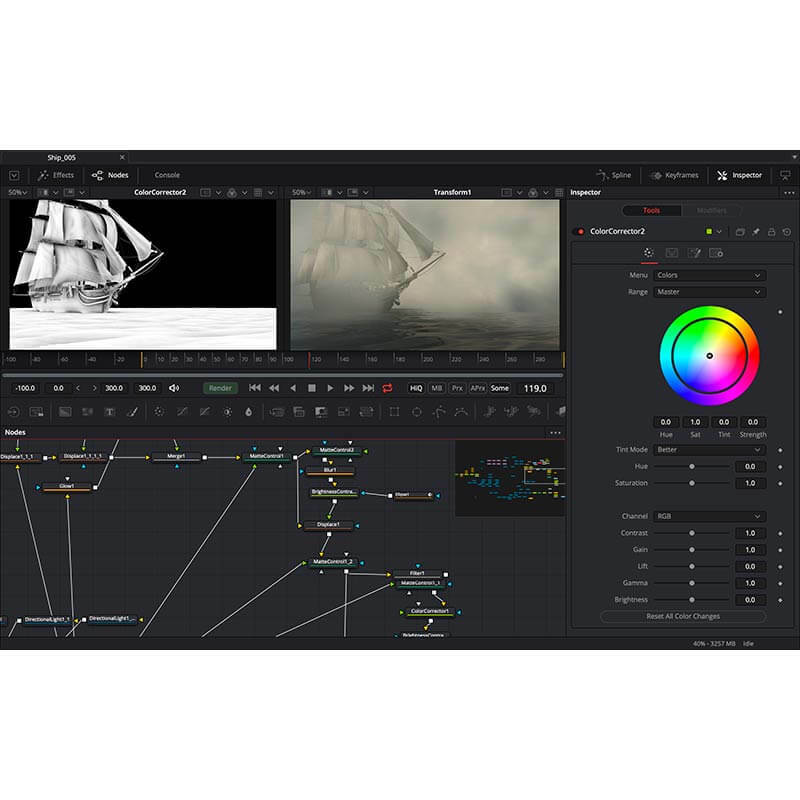 Fusion is the world’s most advanced compositing software for visual effects artists, broadcast and motion graphic designers, and 3D animators. Over the last 30 years, Fusion has been used on thousands of Hollywood blockbuster movies and television shows. Fusion features a powerful node based interface that lets you quickly and easily create sophisticated effects by connecting different types of image processing tools together. You get a massive range of tools, incredible VR and 3D support, GPU accelerated performance, unlimited network rendering and more. Fusion gives you everything you need to create exciting broadcast graphics, dramatic titles, and even major feature film visual effects. Fusion Studio 16 is a major upgrade that brings all of the improvements made to Fusion inside of DaVinci Resolve to the stand alone version of Fusion. You get an updated and more modern user interface, along with dramatically faster performance. All 3D operations are GPU accelerated, making Fusion much more responsive and interactive. In addition, there are dozens of GPU accelerated tools such as time effects, dissolves, stereo tools, vector motion, corner pinning, colour tools and more. B-spline and bitmap mask operations are accelerated, as are the planar and camera trackers. Improved memory management makes large compositions with high tool counts more reliable, making Fusion 16 dramatically faster and more stable than ever before. Thousands of Hollywood’s biggest blockbusters and hit television shows use Fusion to create their groundbreaking visual effects. Fusion has been used on feature films like The Hunger Games, Dr Strange and Guardians of the Galaxy, as well as hit television shows like Empire, NCIS and American Horror Story. Fusion also plays a major role in the development of cinematics for major video games such as Dawn of War III, Halo 5 and more. Nodes are incredibly easy to use, especially as scenes become more complex. Fusion’s nodes are small icons that represent effects, filters and other image processing operations. Nodes can be easily connected together to build larger and more complex visual effects. Tools, images, and objects can be combined in any order to create unlimited visual effects. Simply click on a node to quickly adjust any single part of your project. That’s much faster than a timeline based tool because you don’t need to hunt through nested stacks of confusing layers and filters. Whether you need to pull a key, track objects, retouch images, animate titles, or create amazing particle effects, Fusion has a massive toolset that lets you tackle the most demanding jobs. You get a true 3D workspace along with tools for compositing, keying, painting, animation, virtual reality, stereoscopic 3D and more. Fusion combines effects and motion graphics, along with 3D modeling and rendering into a single toolset. That means you can import and render 3D models and scenes with the rest of your composite in Fusion. You don’t have to pre‑render assets or transfer between multiple applications. Use the new Panoramic Viewer to work in 360º VR environments, or wear popular VR headsets and get incredible interactivity so you can see your work in realtime. Take advantage of both RGB colour and XYZ position information in each pixel when using OpenEXR files so you can blend 2D images with 3D elements like volumetric fog and lights with interactive control. 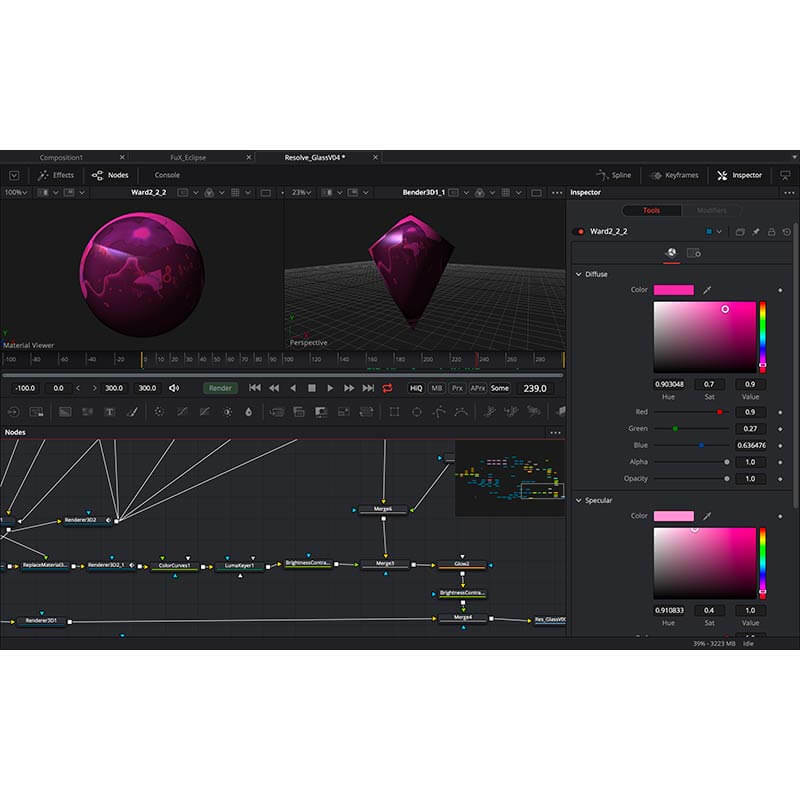 Built on an extensible and customizable framework, Fusion allows game developers, 3D feature film animators and media artists to use its open architecture to extend their own internal systems. Fusion supports both Lua and Python, a popular and intuitive scripting solution used by animators worldwide. You can save time by writing scripts to create custom tools, pass data back and forth between Fusion and other applications, automate repetitive tasks, and even add entirely new features. Fusion is extremely fast and responsive enough to be used in high pressure, client driven sessions. With its GPU acceleration, you get instant feedback while you work so you can see exactly what you’re doing. Fusion 9 features more GPU and OpenCL pipelining than ever so whether you’re working alone or with a client, you get the real time control you need. That means you’ll be able to spend more time being creative and less time waiting. Fusion is so fast that you can even work in VR while wearing a headset and still get over 90 frames per second of interactivity. Fusion has the world’s fastest production quality render engine. With Fusion Studio, you can even distribute your render jobs across an unlimited number of networked computers for incredible performance, at no additional cost. There’s no “per node” render license fees. Simply install it on as many render nodes as you need. That means you can render complex scenes incredibly fast to meet the intense deadlines of production, without having to sacrifice creativity or quality. 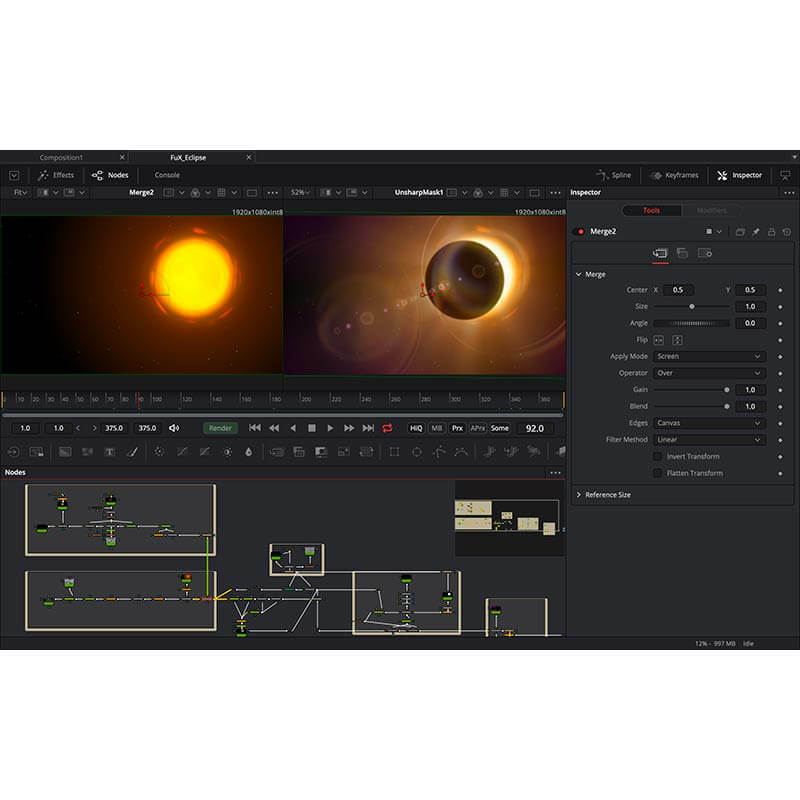 Fusion Connect lets DaVinci Resolve and Avid Media Composer editors take advantage of Fusion’s massive visual effects and motion graphics toolset, right from their timelines. Editors can select individual clips or layers of clips and send them to Fusion. A new Fusion composition is automatically created and linked dynamically back to the timeline. You can work on the VFX and motion graphics yourself or, if you’re on shared storage, let another artist work on them for you. Once the Fusion composition is rendered, the shots are automatically updated back in the DaVinci Resolve or Avid Media Composer timelines. When you’re working with a large creative team, Fusion Studio also includes the new Studio Player application. Studio Player features a single layer timeline with basic shot trimming, storyboard tools, versioning and annotation notes. Fusion Studio also features a bin server to let everyone share and see common assets that are needed for the job. That means you don’t have to copy and track multiple elements on different computer.